The most common clinical signs of conjunctivitis include discharge from the eyes (watery, mucoid or mucopurulent), squinting or excessive blinking, and redness or swelling around the eyes. Conjunctivitis often involves both eyes, but only one eye may be affected in certain conditions. Conjunctivitis may occur with other clinical signs such as nasal discharge, sneezing or coughing. The most common causes of conjunctivitis include bacterial and viral infections, allergies, hereditary conditions, and tumors. Conjunctivitis may be a secondary symptom of another eye disease. Bacterial infections that are not associated with another condition such as keratoconjunctivitis sicca ("dry eye") are rare in adult dogs. However, puppies can have bacterial infections even before their eyes are open. Viral infections such as canine distemper virus. Immune-mediated disorders such as allergic conjunctivitis (especially common in pets with atopy or seasonal allergies), plasma cell conjunctivitis (especially German shepherds), and Pemphigus. Tumors of the eyelids and conjunctiva are rare in dogs. 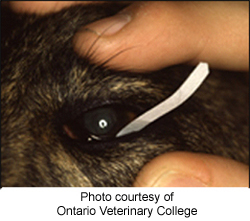 Breed-associated conditions such as nodular episcleritis in collies and collie crosses. Eyelid abnormalities such as entropion or ectropion and eyelash disorders such as distichiasis and ectopic cilia often cause secondary conjunctivitis. 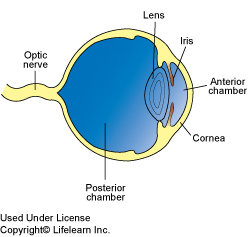 Obstructed nasolacrimal or "tear" ducts can cause inflammation of the tissues surrounding the globe of the eye. Trauma to the eye or irritation from foreign bodies, smoke or environmental pollutants can cause inflammatory conjunctivitis. Other eye disorders such as ulcerative keratitis, anterior uveitis and glaucoma. The main goal of diagnosis is to determine if the conjunctivitis is a primary or secondary problem, if there is additional disease or damage to the eye, if the condition is allergic, or if it involves the tissues of the eye itself (sclera). In order to differentiate many of these conditions, a complete and detailed ophthalmic examination must be performed. This will include close examination of the adnexa or surrounding eye structures (eyelids, eyelashes, tear ducts, third eyelid, etc. ), tear production tests (Schirmer tear production test), corneal stain tests to ensure that the cornea is not damaged, and measurement of intra-ocular pressure to rule out glaucoma or uveitis. Additional tests that may be performed include nasolacrimal duct flushing, bacterial culture and sensitivity tests, conjunctival cytology or biopsy and allergy testing. "Treatment...may include both topical and oral or systemic medications." Treatment is directed at the specific cause and may include both topical and oral or systemic medications. Topical gentamicin, tobramycin, chloramphenicol, oxytetracycline, ciprofloxacin or triple-antibiotic ophthalmic ointments and solutions are commonly prescribed. Some patients will receive medications containing anti-inflammatory agents such as ophthalmic prednisolone or dexamethasone. In dogs that have secondary conjunctivitis, oral antibiotics or anti-inflammatory medications may also be used. Patients diagnosed with KCS will usually require medications such as cyclosporine or tacrolimus to stimulate tear-production. Patients with eyelid or eyelash abnormalities will require surgical correction. Will my dog recover from conjunctivitis? Most dogs have an excellent prognosis in most cases of conjunctivitis. Severe, chronic or recurrent conjunctivitis may have a guarded prognosis, depending on the definitive diagnosis. Conditions such as KCS and immune-mediated disorders may require lifelong therapy.